Criminal justice schools in California take on many forms. Whether students hope to research laws to support a court case as a paralegal, help rehabilitate convicts as a corrections officer or check for signs of arson as a fire investigator, there are a variety of criminal justice education programs that can prepare students for fulfilling careers in the legal and protective services fields. Students looking to for criminal justice schools in California are in good company - California employs more protective and legal service professionals than any other state. While finding the right program can be daunting, the tools in this guide can give prospective students a clear look at their options and learn more about different careers and educational requirements along the way. After Criminal Justice School in California: What's Next? California's higher education systems is expansive, and prospective criminal justice students may be overwhelmed by the number of available schools. 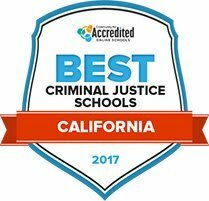 This tool ranks the best criminal justice schools in California by various factors, like tuition costs, total enrollment and student-teacher ratio. The Administration of Justice program at Lassen Community College gives students the opportunity to pursue a degree while collaborating with experienced faculty members. Students will enroll in a series of courses that cover the information required to excel in this field. Course topics includes areas such as juvenile procedures, criminology, correctional science and investigative techniques. Those requiring academic assistance can attend the Learning Center's hours of operation to receive tutoring sessions, student workshops, or access the computer lab. The Training, Education and Collaboration Center (TECC) is also available to give students professional development opportunities with individualized training, webinars, networking and e-learning modules. Through the Administration of Justice program at Contra Costa College, students are able to receive the necessary training to work as a professional in a criminal justice field. The program is designed to equip students with important skills such as communication strategies, writing for criminal justice roles, and ethics and leadership. Upon graduation, students may be able to successfully pass various academy programs or enter the workforce or transfer their credits to continue pursuing their education at a four-year institution. The Law Enforcement & Correctional Training program at Fresno City College provides entry-level students and existing professionals the area-specific skills needed to excel in a criminal justice field. Also known as the Fresno City College Police Academy, students are able to enroll in various areas of study including administration of justice, police and correctional academies, and requalification courses. Prior to enrollment, students are encouraged to begin a regular physical conditioning program so they pass the Physical Agility Test. Veterans are also able to apply their G.I. bills towards the cost of tuition by contacting the school's Veteran's Office. At Santa Rosa Junior College, students are able to enroll in the Administration of Justice for Transfer degree program to begin or advance their career in a criminal justice occupation. This program is designed to educate students with comprehensive theory and hands-on practice of criminal justice studies so they may qualify to further their education at a four-year institution. Upon successful program completions, students should be well-versed in the area-specific communication, critical thinking, legal and other areas within this discipline. The Administration of Justice department at Long Beach City College gives students the opportunity to study four different areas that fall under criminal justice disciplines: administration of justice, criminal forensics, public administration and public service. These associate degree programs are intended to result in immediate employment eligibility in a student's respective field or to transfer to a four-year institution for further academic instruction. For those looking for further backing, the Department of Counseling and Student Development is available to assist students in balancing their personal, academic, and professional lives in order to support student development and academic success. Fresno Pacific University has wide array of degree options, including undergraduate degrees for students interested in pursuing a career in areas such as law enforcement, corrections, mediation, paralegal, administration and social services. Related degrees offered at Fresno include a BA degree in criminal justice or pre-law, a graduate certificate in restorative justice and an evening BA degree completion program in criminology and restorative justice, which is geared towards those interested in the study of criminal justice practices, rather than law enforcement These programs are designed to prepare students for employment in the criminal justice system while also setting a foundation for further education. National University has several degree paths for those interested in the criminal justice field, including online degree options. Students can minor in criminal justice or can earn a certificate or BS degree in criminal justice administration, a BS degree in homeland security and emergency management or a master's degree in criminal justice. In addition, National University offers several transition programs, in which students can transition from a BS in criminal justice administration to a master's in criminal justice administration, forensic science, public administration or juvenile justice. Students may be able to receive credit for previous experience such as past employment, military training, community service and non-credit courses. At California State University, Los Angeles, students can earn degrees in both criminalistics and criminal justice, including a minor in criminal justice or forensic science, a BS degree in criminal justice or a master's degree in criminalistics and criminal justice. The minor in criminal justice is geared towards those interested in administration, with lower and upper-level courses required. The BS degree focuses on theory, research and law, with over half the courses major-related. The Master's program combines research with practice, and offers students a unique opportunity, as the program is in the Hertzberg-Davis Forensic Science Center, along with the LAPD and sheriff's office crime labs. California State University San Bernardino students can minor in criminal justice, or earn a BA degree in crime analysis or criminal justice or a MA degree in criminal justice. The MA degree can be completed fully online, or with a combination of online and on-campus courses, and the BA degree program offers some evening and online classes. The BA program can be tailored to a student's interests, with individually selected coursework placing emphasis on a specific area such as law enforcement, corrections, parole or probation. Students resources include academic advising through the Mentor Advising Center, and career counseling with faculty experts. California Baptist University (CBU) is a private Christian university offering students a spiritual and academic educational experience, with criminal justice degree programs designed for students planning a career in the criminal justice system while also providing a foundation for future graduate school work. Students can choose criminal justice as a minor, or pursue a BS degree in criminal justice. The BS degree can be earned online along with general education courses, and once general education requirements are met, consists of lower and upper division courses and degree specific electives. CBU also offers a master's degree in forensic psychology. For many students, finding the right school means looking beyond rankings and scores alone. Taking into account other factors, like student population and available degree levels and concentrations can help narrow the list. This search tool can help students find criminal justice schools in California that not only meet their academic goals, but also fit within their lifestyle and financial obligations. Students who graduate from criminal justice schools in California can pursue a wide variety of careers in-state. While graduates may use their degrees to enter the legal services field, California's most popular careers for criminal justice grads are in protective services. See the table below for details on these careers and their minimum educational requirements, specific to the state of California. Criminal justice schools in California can prepare students to enter a variety of protective and legal fields, and no matter what level of criminal justice degree a student chooses to pursue, they will find many criminal justice professions in California are growing faster and have higher annual salaries than the national average. The following tables note these high-wage and fast-growth careers, along with the level of education needed to get these jobs in the Golden State. Check out how far ahead California ranks above the national averages by scrolling over the bars below. California needs to employ many protective and legal service professionals to accommodate its large population, but certain parts of the state show particularly high employment numbers for those working in criminal justice fields. After attending criminal justice school in California, graduates may find greater potential career opportunities and larger professional networks in these places. Scroll over the dots on the map to learn more about each area, the number of people employed in legal and protective services and their average salaries. An organization committed to helping businesses in the state of California thrive through business compliance practices, the Cal Chamber focuses efforts on making the state a great place to work. From political action to worker compensation, the group tackles many issues facing businesses. For a list of business related regulatory information for the state of California, head to this page on the Secretary of State website. It provides everything from e-file forms to tax information to a California business lookup. Dedicated solely to serving small businesses and their employees, the SBC responds to the unique needs of small businesses. The site provides information on advocacy campaigns and allows users to submit their input, so ideas are easily shared and acted upon. Representing the men and women who work in California’s correctional facilities, this page provides information on the industry, prison reform and culture. Serving the supervisors and managers working in the California State Corrections system, the CCSO protects and represents the values of members through legal representation and with labor-related issues. A site dedicated to California’s Richard A. McGee Correctional Training Center. Learn what it takes to serve, what a day in the life of a CDCR Cadet looks like and find more information on becoming a peace officer in California. An all-encompassing page from the Department of Corrections, users can find career and general information about the California Corrections and Rehabilitation program here. The page also includes information on the exams necessary to work in the state, and other employee-specific resources. Representing correctional personnel and citizens interested in the professional workings of the California Correctional System, the CPPCA works in government affairs and supports research relevant to the corrections system. A department of the state of California dedicated to investigating complains of judicial misconduct and assigned to disciplining judges. Check out this site for more details on pending cases, obtaining certification to become eligible for commission membership or to file a complaint. This committee was designed to help past and present employees of California’s court system train and prepare for leadership roles, keep up with ever-changing laws and help review and make recommendations on pending legislation. The California Department of Justice provides information on government careers in the criminal justice field, including fellowships and scholarship programs. A professional group supporting judges and justices across the state of California, the CJA holds educational conferences, provides publications for currently serving and retired justices and appoints ethics and other committees to ensure the well-being of judges in California’s justice system. With a focus on balancing California’s justice system and impacting policymaking, the CJCJ offers news and educational information on juvenile justice and adult correctional reform. The California Branch of the ACJR is a professional group that aims to improve criminal justice practices in all sectors through discussion and research. Members have access to conferences and networking opportunities with other criminal justice professionals. This professional association’s goal is to protect and promote people’s rights under the Constitution. Their website provides information on legislation as well as internship and career opportunities. With an aim of increasing access to justice and legal resources for underserved California citizens, the Campaign for Justice offers opportunities for everyone from community members to attorneys to get involved in legal aid activities and events. Students looking to become attorneys in California will want to visit this website for all the information they need to become practicing lawyers in the state. This association of western states, including California, aims to improve criminal justice practices through academic research. Students are encouraged to become members. A non-political organization established to help offer California peace officers the best possible benefits for their service. Information on Long Term Disability plans can be found here, as well as scholarship opportunities for students. A collection of information for California’s police, sheriffs and highway patrol officers, this site provides information on specific departments across the state, as well as training information, community partnership opportunities, news and events. With a mission of building a relationship between the law enforcement community and California youth, the CPYA provides productive activity opportunities for at risk youth. For more information on the program, becoming a positive adult role model and scholarships. This professional association is comprised of all types of law enforcement professionals throughout California. Members receive a variety of benefits, but even non-members have access to news articles, press releases and more. A quarterly publication from the California Peace Officers Association that includes timely articles written by law enforcement, judicial and law education professionals on subjects like leadership, community expectations and building credibility. California’s largest public safety organization provides this site, with information on advocacy programs, training sessions and labor relations for peace officers across the state. There is also a job board for peace officer prospects. A page representing police officers working on college and university campuses across the state of California. The site addresses pertinent current events and news items, conducts leadership surveys and provides information and links to supported charities. From legislative advocacy to professional awards, the CAEP has a variety of local chapters across the state of California. They publish a quarterly magazine, “The Environmental Monitor”, which gives information on leaders in the profession, news and job opportunities. Fire is a major problem in California, and this site is dedicated to providing information on criminal fire investigation training, employment, scholarships and public fire safety. Find information on hunting and fishing regulations and environmental action plans being implemented across the state of California. Users can purchase licenses and permits, contribute to wildlife programs, get tips on conservation and find out more about recreational services in their region. A collection of attorneys and legal administrators focused on environmental justice, ELF provide access to legal information regarding environmental preservation, enforcement and resources, and works to link at-risk communities to legal and scientific resources they need to combat environmental problems. This local branch of the national PEER alliance works with scientists, land managers, environmental law enforcement agencies and other field specialists to help manage and protect public and environmental resources is California. Katharine Tellis is an Associate Professor for the School of Criminal Justice and Criminalistics at California State University Los Angeles. She has both a Bachelor’s in Gender Studies and Master’s of Social Work from UCLA and a PhD in Criminal Justice from the University of Nebraska at Omaha. Her areas of interest include race, class, and gender, violence prevention and criminal justice policy. What should students look for in a Criminal Justice program in California? AStudents should look for a diversity in class offerings as well as the instructors who teach them. Courses should cover everything from law enforcement, the courts and corrections, in addition to re-entry and community-based issues that often intersect with criminal justice. It is also helpful to have “real world” opportunities for students such as service learning placements in the field where students can apply the skills they are developing in the classroom. Faculty should have both academic credentials (graduate degrees) and practical or research experience (all three are a plus). It is critical that faculty reflect the diversity of the student body they serve to ensure the best educational environment that will translate to success professionally, especially given the social issues we face in the present. What are some of the most important skills students learn in a California criminal justice program? AThe most important skills students should learn include critical thinking, professional writing and emotional intelligence, e.g. empathy in particular as well as other interpersonal skills to assist when interacting with the diverse populations who work within and interface with the criminal justice system. How will these skills help California students in their careers? AThese skills translate into success in the workplace because students are then better situated to identify, evaluate and problem-solve the ethical, logistical and technical issues that inevitably emerge as a criminal justice professional in California.